Before the 1940s, where two forested ridgelines meet a mile from downtown Durham, North Carolina the house I live in was only a carriage house for large brick house. The street where I live was then only a short gravel driveway off another street. The old house is gone now, evidenced only by a remnant of its chimney next door and the ubiquitous bricks that surface when planting understory trees and shrubs. During its time, a series of charming and sturdy duplexes had been terraced down the hillside from the driveway for the families of returning GIs after World War II and the driveway stub was extended a few feet to accommodate a parking entrance for the duplexes. Then a returning bomber pilot and his wife extended it into a road all the way down the ridgeline to their new home overlooking a heavily wooded bottom land that Willie Carver, a veteran of an earlier World War, had deeded a to the city for a park many years before. Developers back in Willie’s day, with the exception of those building in lower socio-economic areas, understood on their own to “let floodplains be floodplains” rather than trying to finagle to build on them by encroaching on stream buffers, as many do today. 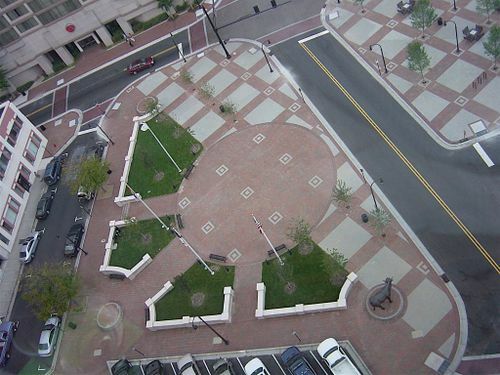 Carver understood the far greater value of amenities on development. He was third-generation Durham, raised up in the very northwestern corner of the county in a historic 1850s house past where I often ride on Harley excursions, after a winding several miles north from the Little River Regional Park & Natural Area. The old Carver house has been repurposed as the office for Tree Frog Nursery, less than a mile up NC 57 (Old Hillsborough Road) and across the line today from the pit entrance to Orange County Speedway, a former NACAR track where, now four-time champion, Jeff Gordon was cutting his teeth shortly after I moved to Durham. Back when Willie was born, the closest racing was further down NC 57 at a horse racing track on Occoneechee Farm, owned by “General” Carr, who after the Civil War was a partner in the production of Bull Durham tobacco and one of the leaders who around that time was bringing what would become Carver’s alma mater to Durham. The year I was born, the old horse track was converted into one of NASCAR’s inaugural speedways where former “thunder road” driver Junior Johnson and Richard Petty famously raced and won until religious leaders shut it down in the late 1960s. Willie’s parents, Hosea and Emma were merchants near the Durham County crossroads of Rougemont and owned a sawmill. Before he headed down to Durham proper to attend Trinity College, which was in the process of being relocated here just as he was was born, his parents even toyed with the idea of a textile mile. Returning from WWI, Carver finished his degree and was studying law when another Durham native, James Buchanan Duke, transformed Trinity into Duke University which in turn launched another transformation of Durham. In 1988, after building a successful realty and insurance business, Carver passed away. That was the year before I arrived in Durham to jump-start Durham’s transformation as a center for visitor-centric economic and cultural development. But it was from J.B. Duke that Willie’s generation learned about the importance of continual and never-ending community economic transformation. It is easy to see that something needs to be done when core industries are in decline. It is quite another to anticipate transformation. Looking down in the 1940s from his apartment atop the old Washington Duke Hotel, Carver, like George Watts Hill, who was next door in his C-suite above Central Carolina Bank, was anticipating transformation was needed even while tobacco and textile factories hummed as never before. 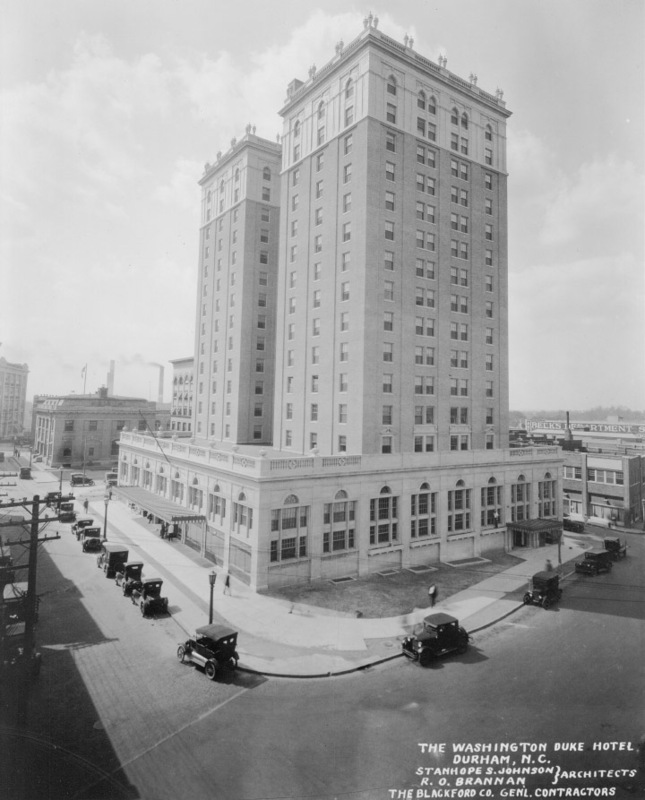 The 16-story hotel had been erected in 1924 while Willie was in law school. It replaced the New Academy of Music which had stood on the site until T.Y. Milburn supervised construction nearby of the Durham Auditorium, now the historic Carolina Theatre. In 1950, a few years after deeding Rockwood Park to the city, Carver was among the Durham Committee of 100, an organization that in twelve short years, fulfilled its mission by accomplishing three pivotal achievements that transformed Durham and North Carolina to what they are today. The hotel where Carver first contemplated the need for transformation in the 1940s was imploded in 1975 and served as parking until recently transformed in Hill’s honor into CCB Plaza. 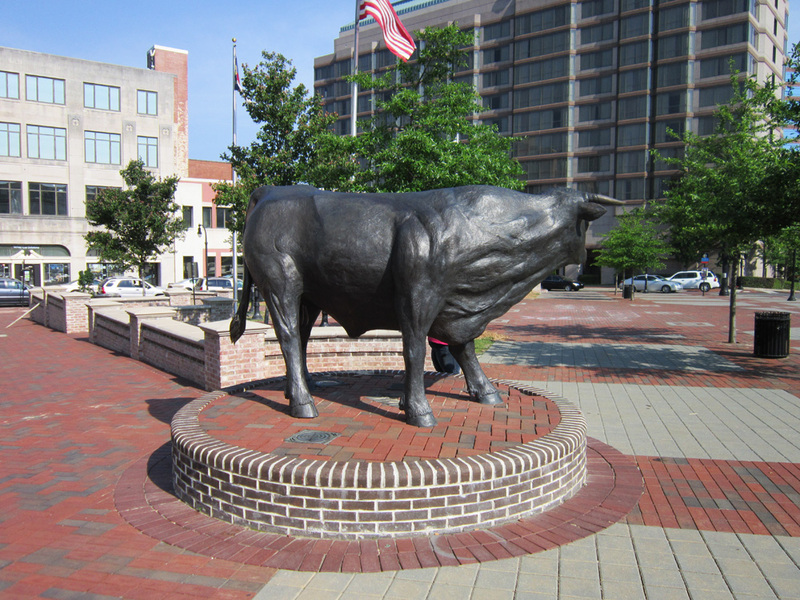 It is now home of a life-size bull, in honor of one of Durham’s legacy signatures, “The Bull City,” earned in part by relentless transformation. Hill’s bank is gone now too, and the building now being transformed into the fifth 21C Museum Hotel, a response to Durham’s emergence over the past two decades as a visitor destination. But Willie Carver’s park still lives. No disrespect to those who take or are given well-deserved credit today, but everything being done, including the transformation of downtown Durham, rests on the shoulders of mid-century transformers such as Willie Carver and the Durham Committee of 100.